Giant Amoy Soy Sauce Portrait Marks the Year of the Monkey. 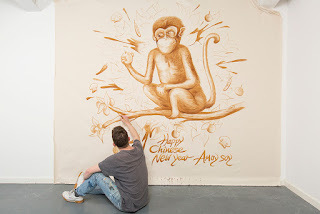 Celebrate Chinese New Year and the Year of the Monkey, the UK’s number one soy sauce brand Amoy has got things off to a swinging start with a giant monkey portrait painted entirely out of Soy Sauce. The Amazing artwork is larger than life at 8ft x 8ft and has been created by artist Will Vibes who over the course of a single week made the finishing splashes bring this cheeky monkey to life. 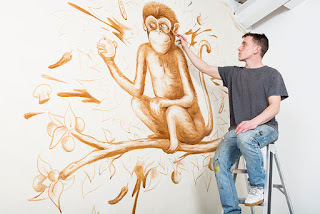 The concept was to bring to life the enthusiastic and thoughtful nature of the celebrated Monkey, along with a key ingredient of Chinese cooking. The Year of the Monkey celebrates witty, intelligent, mischievousness and curious personality traits and just like the animal ensures that creativity is at the heart of everything. 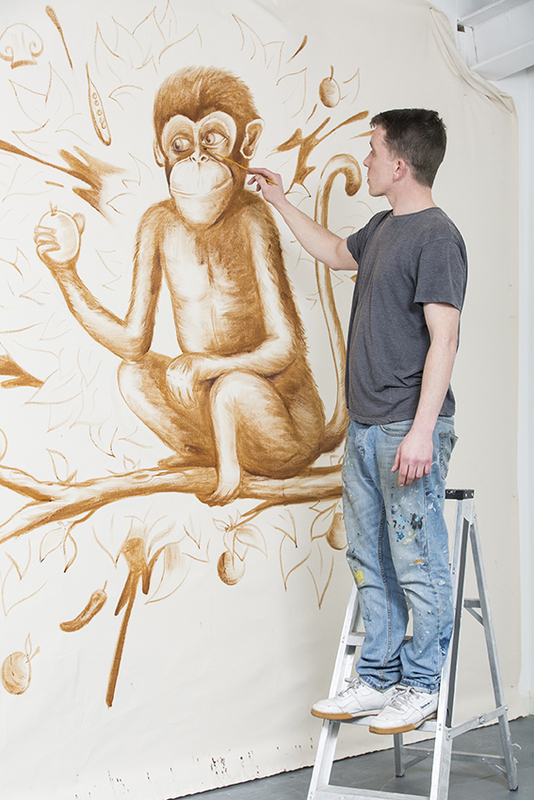 The larger than life soy-trait, which is over five times bigger than your average Monkey, amazed onlookers and certainly showed everyone that there is no business like Monkey business! Chinese New Year is very popular in the UK, and thousands of spectators joined the festive fun at Trafalgar Square to celebrate Chinese New Year last year. In 2016, over 300,000 families, government officials and VIPs are set to attend London’s Amoy-sponsored festivities, which will make the upcoming February 14th occasion the biggest the UK has ever celebrated. Alongside the rising interest in Chinese New Year, Asian food has increased in popularity over the past couple of years with sales of Amoy Soy sauce increasing by 8.7% in the last year alone. However, Soy Sauce is not primarily popular because of its artistic attributes but rather its tasty table top versatility. 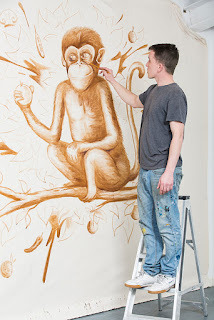 But in order to specially celebrate The Year of Monkey, Amoy decided to swap forks for paintbrushes and explore a creative new ‘serving suggestion’ for the modern family classic. Amoy, the top authentic oriental food brand, will be the primary sponsor of this year’s Chinese New Year celebrations in London on the 14th February 2016. WIN Tickets To Amoy Chinese New Year Celebrations. Amoy, the top authentic oriental food brand, will be the primary sponsor of this year’s Chinese New Year celebrations in London on the 14th February 2016. 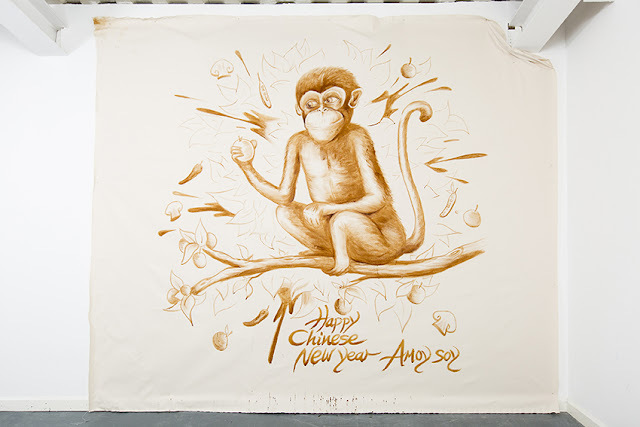 Amoy will host a special VIP tent in Trafalgar Square all day on Sunday 14th February 2016 and consumers able to gain access to the VIP tent during the celebrations by following and tweeting @AmoySoySauce #SoyMonkey. I have not been gifted in any way for sharing this information.